Client : Shaant Infosystems (P) Ltd. Reliable Technologies has helped GiftstoIndia24x7.com in being one of the leading service providers for sending Gifts to india. The client wanted to develop a website which was clean to look and but vibrant at the same time. The colour combination of Red and White was used to achieve this. - Home PageThe compact design of the home page has everything that the site offers in a nut shell. A user will be able to see the latest arrivals on the website along with the all time best selling gifts. 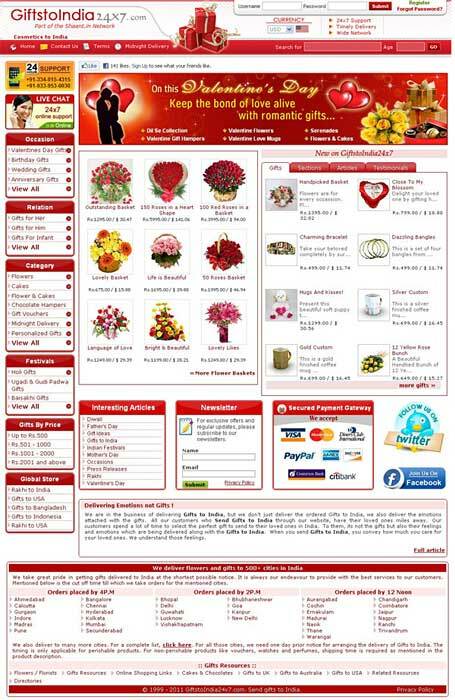 On the left side is the category panel which displays all the categories of gifts which the company deals in.